Staying in NYC for the holidays? Visiting the Big Apple from Cleveland and looking for a Backers Bar in NYC? You’re in luck. The Big Apple Browns Backers of NYC will 100% be hosting our NYC watch party for the December 24th Cleveland Browns game versus the Chicago Bears. Doors open at 11:30 for the 1pm kickoff. We’ll be upstairs at the main bar and likely have the entire place to ourselves. So come join us and your fellow CLE fans as we watch Hue Jackson, Jimmy Haslam and the win-less Browns give out lumps of coal to all their dedicated fans. The Union Square Browns Backers will 100% be hosting our NYC watch party for the October 29th Cleveland Browns game in London. Doors open at 9am for the 9:30am kickoff. We’ll be upstairs at the main bar and have the entire place to ourselves. $25 gets you a breakfast buffet (eggs, tots, bacon, build your own breakfast tacos) and unlimited mimosas, Bloody Marys and Coors Light drafts. Why are we doing this, you ask? Why wake up so early on a Sunday morning after what will likely be an aggressive Halloween Saturday? 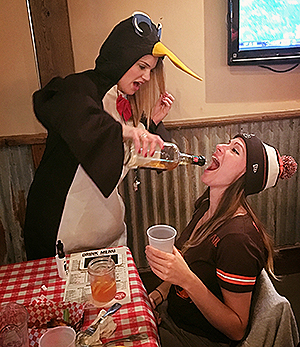 Why subject ourselves to yet another embarrassing display from the incompetent gaggle of clowns that are the Cleveland Browns, in what will be yet another loss on their march to an 0-16 season? Because we’re gluttons for punishment and our parents never hugged us as children. So come join us and your fellow CLE fans as we watch Hue Jackson and Jimmy Haslam bring their factory of sadness dumpster fire across the Atlantic and BURN LONDON TO THE GROUND. Free shots if you show up in your Halloween costume from the night before.